It’s a brown shirt with white buttons. It only has a breast pocket on the left. In certain lights, it can almost look like a deep green. 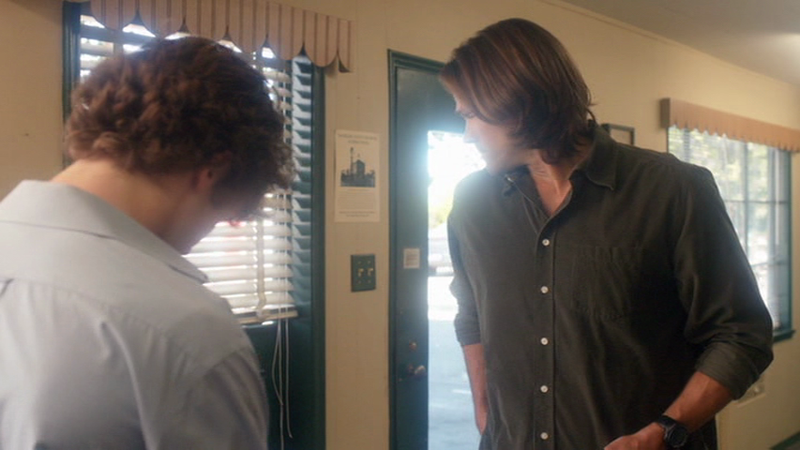 In Mystery Spot (3x11), Sam wears this shirt during the 6 months that he lives without Dean (when we see him eating and cleaning guns in the motel room). In Wishful Thinking (4x08), Sam wears it to go see Wes. He changes out of it after he is brought back from the dead. In On The Head Of A Pin (4x16), Sam wears it for the entire episode. 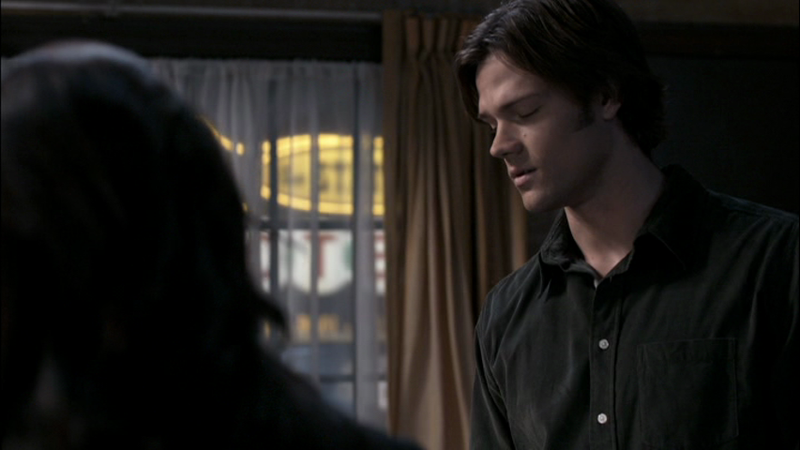 In The Rapture (4x20), Sam wears it from when they find Jimmy at the warehouse until Jimmy escapes. In The Song Remains The Same (5x13), Sam changes into it after Michael resurrects and returns him to 2010. In 99 Problems (5x17), Sam wears this shirt to Dylan’s funeral, through to when Cas shows up. He has changed clothes by the time Dean gets back to the motel the next morning. In Like A Virgin (6x11), Sam wears this shirt when he is researching in the motel room (while Dean is in San Francisco), he calls Bobby and then talks to Castiel. In Blood Brother (8x05), we see Sam wearing this shirt during a flashback to when he got his job as a handyman at a motel by offering to fix their air conditioner. In Devil May Care (9x02), Sam wears this shirt when he and Dean return from rescuing the Hunters from Abaddon and he and Dean discover that Kevin has spoken with Crowley. He wears it until the end of the episode. In Rock and a Hard Place (9x08), Sam wears this shirt when he and Dean go to investigate the church that the victims all had in common. He wears it until Vesta is killed. In The Executioner’s Song (10x14), Sam is wearing this shirt when he and Dean are at the food truck and Cas calls about having found Cain’s graveyard. I HAVE A LOT OF THESE SHIRTS IN A LOT OF SIZES FOR SALE! If you're interested in buying one of Sam's dark brown shirts, please contact me at tylertroost@gmail.com. Also, I have some of Dean Winchester's clothing & 2 of Sam's jackets in a lot of sizes. I look forward to hearing from you!